On June 17-18, 2017, the inaugural workshop of the new-born network Intersections, a network dedicated to examining various forms of intersectional discrimination, will take place in Saarbrücken. A series of scholars gather under the title “Intersections 2017: Queer / Migration / Legality” to discuss their approaches and analysis concerning the topics of queer, migration, legality, and belonging, with a special focus on Queer People of color and queer migration. Collisions of Western and non-Western understandings of gender and sexuality are dealt with, as well as gender and sexually non-conforming identities as reasons for discrimination, persecution, and consequently flight; hetero- and homonormativities as well as strategies of pinkwashing and/or straightwashing are examined and brought to light. The focus on Queer, gender and sexually non-conforming subjectivities unites the contributions from different disciplinary backgrounds such as literary and cultural studies, linguistics, social and political sciences, anthropology and law. The workshop topics are elaborated through a Gender, Queer, or Sexuality Studies lens and grounded on theories of intersectionality (cf. Crenshaw) and/or assemblages (Puar). 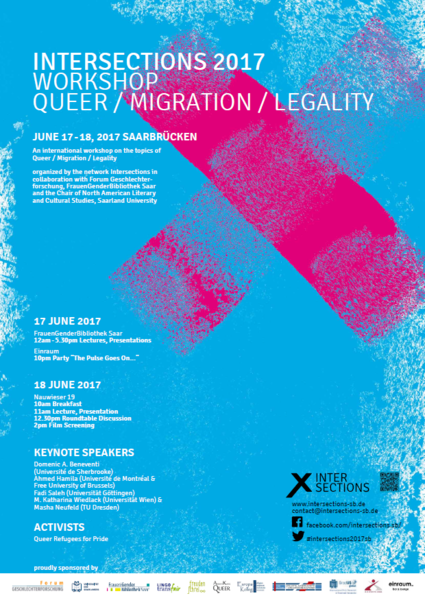 By uniting topics of queer, PoCs and migration, this workshop aims to make a contribution to Saarland University’s focus on Border Studies, and establishes a firm link to Gender and Queer Studies. The conference proceedings will be published in Saarland University’s book series SOFIE.